If you live in or around Allegan County, please keep your eyes open for this 77 year old missing man, Marshall Kenyon. Anyone with information about Marshall Kenyon’s whereabouts is asked to contact Allegan County Central Dispatch at 269-673-3899. ALLEGAN COUNTY, Mich. (NEWSCHANNEL 3) – The Allegan County Sheriff’s Office is asking for help in locating a missing person. Marshall Boyd Kenyon is a 77-year-old male who suffers from mild dementia/Alzheimers and is in generally poor health. Marshall was last seen on Monday, December 1st around 2:15 pm, leaving his home in Plainwell, Michigan. Marshall was headed out to get mail and cigars in the Plainwell area. Marshall was driving a gray and tan 2003 Buick Century with a Michigan plate ‘BGF 1822.’ Marshall was last seen wearing a red and black Carhart jacket, stocking cap, jeans and boots. Marshall also wears glasses. Anyone with information about Marshall Kenyon’s whereabouts is asked to contact Allegan County Central Dispatch at 269-673-3899. Here’s another article and video about Heather on CBS4. And another one on WSVN including video, as well. 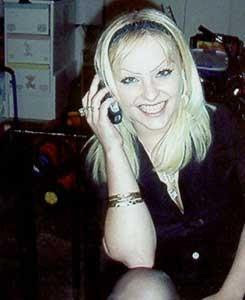 You can find more information about Heather Riggio’s case by doing a Google search. There’s over 26,000 pages of search results. This from Heather’s sister’s Myspace page http://www.myspace.com/heathersmissing “We want as many people as possible to see her picture and know her story…But we need help…we need people to donate gas money and driving time to keep the billboard running…PLEASE contact Sherry @ 561-333-2779 if you can do anything..anything at all helps..thanks a lot, Lisa”. As you can see that Heather’s family is torn up and suffering dearly for the return of their precious “Kitty”. See more picture of Heather here. If you have any information, anything at all, please contact North Miami Beach Police at 305-949-5500. Kid Finders Network is a nonprofit organization which provides mobile billboards to families, organizations and Law Agencies in search of Missing Children and Missing Persons. They have a mobile billboard (pictured above) with Heather’s information and picture on it. It will stay at the police station in North Miami Beach until Monday. After that it will go to the area where Heather was last seen at in Homestead. It will cruise the area, increasing the odds of someone calling with an important tip. The drivers are trained in taking tips, too. You can see my entire set of pictures of the press conference and the mobile billboard by clicking the link under the picture. Lilly’s mom and I could not contain our tears as we watched the press conference taking place. You can’t help but feel overwhelmed with compassion for families experiencing the same suffering. It was heartbreaking. But at the same time, I saw the dedication and all the effort put forth by the detectives from North Miami Beach Police Department. What a blessing for Heather’s family. I’ve been following her case and from the start, these detectives have done such a great job. 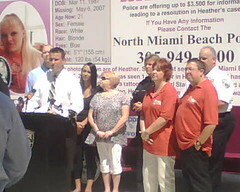 I admire and commend them for their commitment and efforts to find Heather. 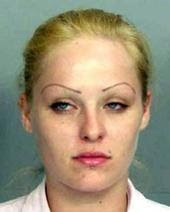 They were able to get her story featured on America’s Most Wanted. For more information regarding this press release please call Detective Rich Rand at 305-218-1234 or Sergeant Warren Hardison. If you live in Arizona, please keep your eyes open for Ms. Elnora Charles. If you have a tip, please contact 911 or 88-CRIME. The Tucson Police Department has announced that the Carole Sund/Carrington Foundation is offering a $5,000 reward for any information leading to the safe return of Ms. Elnora Charles. Ms. Charles is 63 years old, stands 5’1” tall, and weighs 170 pounds. 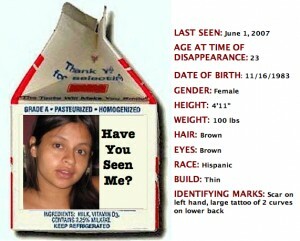 She was last seen wearing a black and red flower dress and prescription eyeglasses. Ms. Charles was last seen by a family member driving northbound on 1 st Avenue at Fort Lowell Road at around 7 p.m. on November 15, 2007. Her car was found abandoned in the Catalina Mountains two days later. Anyone with information is asked to call 911 or 88-CRIME.